Apple has just introduced a new Mac Pro Server, in place of its rack mountable Xserve, which will be discontinued from January the 31st 2011. 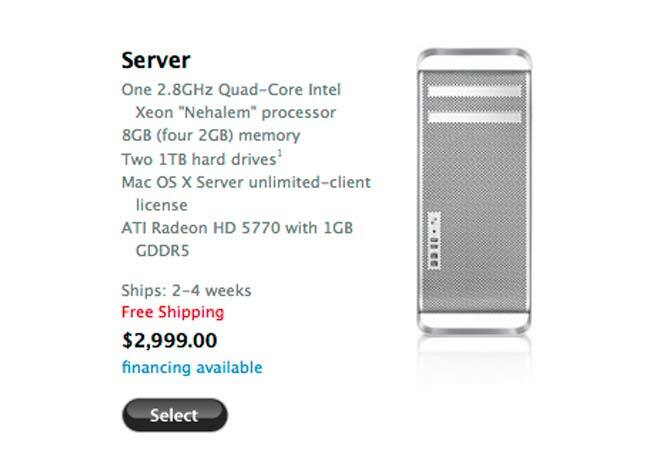 The new Mac Pro Server comes with a 2.8GHz wuad core Intel Xeon Nehalem processor as standard, 8GB of DDR3 RAM, and two 1TB 7200RPM hard drives, plus an 18x Super Drive. Other specifications include an ATI Radeon HD 5770 with 1GB of GDDR5 video RAM, and Mac OS X Server. It till begin shipping in two to four weeks with a starting pricer of $2,999.